We work in a multi-forest, multiple domain environment. Things can be complicated. I removed the user from the AD group and hit the API controller again. This time I received no error. The user was from a forest and domain other than the one that I have administrative permissions to. So I added another user from the same domain to the group to ensure it wasn't something about the user account. I received the same error. On StackOverflow there was an answer that that pointed out that the user running the query had to have the ability to read both the built-in Computers and Users containers. I opened Active Directory Users and Computers and when I browsed to the domain I found that the Computers container did not exist. It had been deleted. I contacted an admin for the domain and I don't have a resolution for this yet, but the app is not going to work properly until that gets fixed. January 30, 2018 by Robert Kaucher. Recently I cam upon a situation where I needed to inject two file paths, stored in a constants file, into a file system service that would be used to list two types of files stored on the web server's file system. I was struggling with how to do this using the IoC pattern with Unity. I found a pretty simple solution using InjectionProperty and nameof. Here is the interface that describes the FileSystemService. Here is the relevant code for the FileSystemService. Inside the BootStrapper or the UnityConfig, wherever you register your types, simply add InjectonProperties to the type registration. I was even able to use nameof on the IFileSystemService interface to pass the property name to Unity. August 18, 2017 by Robert Kaucher. This exact same error seems to have existed in the transition to Windows 8.1 and was due to the system being domain joined. I removed my system from the domain and rebooted it. At that point I was able to install the new build and rejoin the system to the Active Directory domain. Tagged with Windows 10, Consumer Preview. January 23, 2015 by Robert Kaucher. Open Internet Option and select the Security tab, then select Trusted Sites and then configure the zone to automatically authenticate as in the image. This can also be configured via a GPO. "Computer Configuration" => "Windows Components" => "Internet Explorer" => "Internet Control Panel" => "Security Page" => "Locked-Down Trusted Sites". Don't forget to add your intranet domains to the trusted sites as well. Otherwise the GPO will be useless. April 6, 2014 by Robert Kaucher. This exam was a bit easier than the 70-489 exam. It really tested the fundamentals of my knowledge as a SharePoint developer. I was a bit surprised that I did so well on the SharePoint Apps topic. PluralSight has next to nothing on the topic and the only study source that I had was Pro SharePoint 2013 App Development by Steve Wright. That says a lot about the content of his book. 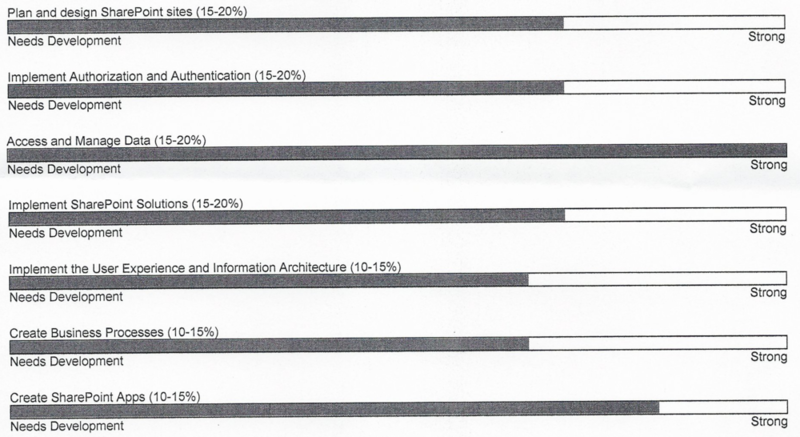 Here is the overall breakdown of my score, an 805 out of 1000. I scored best on the Access and Manage Data objective, which makes me feel good about the work I've been doing and the effort I have put into my studies as that is the focus of what I've been doing professionally for the past three years now. What resources did I find the most helpful? Above all, it was Andrew Conell’s PluralSight courses on SharePoint 2013 development, Stephane Eysken’s series of videos on SharePoint ALM, and Steve Wright’s book on SharePoint Apps. These really helped me get back to the basics of SharePoint development that I had kind of neglected. Regrettably, I think the MVA for this exam was a bit of a waste of time. I got far more out of the SharePoint developer ramp up on PluralSight. Of course, Inside Microsoft SharePoint 2013 is essential, especially for developers who might be transitioning from MOSS 2007 rather than SharePoint 2010. And if you are new to SharePoint as a platform, then you should also pick up the SharePoint 2013 Developer Reference. The best advice I can give you is make sure you know the nuts and bolts of what wizards or designers in Visual Studio are doing, make sure you have a firm understanding of SharePoint administration (all SharePoint devs are SharePoint admins by default), and if you don’t know PowerShell, you don’t know nuttin’! Tagged with MCSD, 70-488, SharePoint. April 5, 2014 by Robert Kaucher. 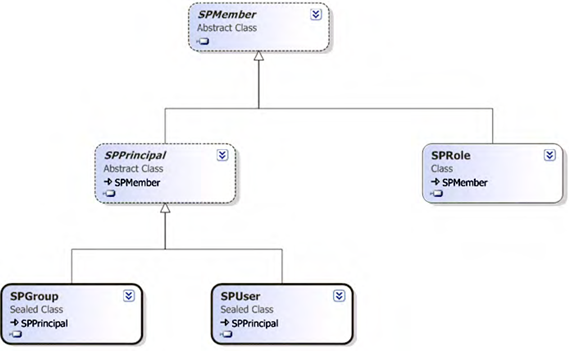 Using Windows PowerShell with SharePoint 2010 and SharePoint 2013 Gary Lapoint [Twitter] [Blog] - For this topic, pay especial attention to the last two parts of the first section. March 29, 2014 by Robert Kaucher. Sahil Malik has 2 very good courses on PluralSight that, while they cover SharePoint 2010, are still very applicable to SharePoint 2013 as nearly nothing in the Server Objectmodel has changed. The only caution that I would have is that you should go over some of the claims material that he covers as that has changed enough that you will not want to rely on his video alone for this exam. One thing to point out, Sahil states that permissions can be logically OR'ed, what does that mean? Here is an explanation and example from MSDN. To define a permission mask that consists of multiple rights, use the pipe symbol ("|") in Microsoft Visual C# or Or in Microsoft Visual Basic to delimit the rights. March 15, 2014 by Robert Kaucher. This guide is for the SharePoint 2013 Developing Core Solutions exam. It covers material listed under the Skills Measured section titled Plan and Design SharePoint Sites. These types of questions should cover between 10% - 15% of the material. If you find this guide helpful, let me and the content creators know on Twitter. March 10, 2014 by Robert Kaucher. I took and passed the exam today after five weeks of exam specific study. In the last week of January, I completed the 20489B exam at MAX Technical Training. It was a weeklong course taught by MVP Mike Smith and was an excellent course that mapped very well to what was actually covered in the exam. There were, however, a few holes as there always are. The major benefit that I got out of the course were the virtual labs. I was able to use them for review and experimentation throughout the month and I plan to reuse the VMs to assist with taking the 70-488 at the end of March. My motivation for taking the Advanced Solutions before the Core Solutions was based strictly on the fact that work was willing to pay for the 20489B course. Tagged with 70-489, MCSD, certification. March 1, 2014 by Robert Kaucher. February 27, 2014 by Robert Kaucher. Tagged with SharePoint, certification, MCSD. February 16, 2014 by Robert Kaucher. Consciously we know that everyone, every single human on this planet, suffers from cognitive biases. If we are interested in improving our selves as professionals and people, we try to be introspective and cultivate metacognition (thinking about thinking). But the fact is we may always fall prey to errors in logic, especially when we are the ones who construct those errors. This article is written for people who are stakeholders in any sort of project but the fact is I hope it can be useful for anyone, especially Product Owners or Scrum Masters to use when working with stake holders to help manage unreasonable expectations when they come. And they always come. July 28, 2013 by Robert Kaucher.